The following selection by John Calvin was taken from book 2, chapter 2 parts 18-21 of The Institutes of The Christian Religion, translated by by Henry Beveridge, Esq. A must read for all Christians who aspire to better understand the Bible's teaching on man's spiritual impotence prior to the regeneration of the Holy Spirit. If we were persuaded of a truth which ought to be beyond dispute, viz., that human nature possesses none of the gifts which the elect receive from their heavenly Father through the Spirit of regeneration, there would be no room here for hesitation. For thus speaks the congregation of the faithful, by the mouth of the prophet: "With thee is the fountain of life: in thy light shall we see light," (Ps. 36: 9.) To the same effect is the testimony of the Apostle Paul, when he declares, that "no man can say that Jesus is the Lord, but by the Holy Ghost," (1 Cor. 12: 3.) And John Baptist, on seeing the dullness of his disciples, exclaims, "A man can receive nothing, unless it be given him from heaven," (John 3: 27.) That the gift to which he here refers must be understood not of ordinary natural gifts, but of special illumination, appears from this - that he was complaining how little his disciples had profited by all that he had said to them in commendation of Christ. "I see," says he, "that my words are of no effect in imbuing the minds of men with divine things, unless the Lord enlighten their understandings by His Spirit." Nay, Moses also, while upbraiding the people for their forgetfulness, at the same time observes, that they could not become wise in the mysteries of God without his assistance. "Ye have seen all that the Lord did before your eyes in the land of Egypt, unto Pharaoh, and unto all his servants, and unto all his land; the great temptations which thine eyes have seen, the signs, and these great miracles: yet the Lord has not given you an heart to perceive, and eyes to see, and ears to hear, unto this, day," (Deut. 29: 2, 3, 4.) Would the expression have been stronger had he called us mere blocks in regard to the contemplation of divine things? Hence the Lord, by the mouth of the Prophet, promises to the Israelites as a singular favour, "I will give them an heart to know me," (Jer. 24: 7;) intimating, that in spiritual things the human mind is wise only in so far as he enlightens it. This was also clearly confirmed by our Saviour when he said, "No man can come to me, except the Father which has sent me draw him," (John 6: 44.) Nay, is not he himself the living image of his Father, in which the full brightness of his glory is manifested to us? Therefore, how far our faculty of knowing God extends could not be better shown than when it is declared, that though his image is so plainly exhibited, we have not eyes to perceive it. What? Did not Christ descend into the world that he might make the will of his Father manifest to men, and did he not faithfully perform the office? True! He did; but nothing is accomplished by his preaching unless the inner teacher, the Spirit, open the way into our minds. Only those, therefore, come to him who have heard and learned of the Father. And in what is the method of this hearing and learning? It is when the Spirit, with a wondrous and special energy, forms the ear to hear and the mind to understand. Lest this should seem new, our Saviour refers to the prophecy of Isaiah, which contains a promise of the renovation of the Church. "For a small moment have I forsaken thee; but with great mercies will I gather thee," (Is. 54: 7.) If the Lord here predicts some special blessing to his elect, it is plain that the teaching to which he refers is not that which is common to them with the ungodly and profane. It thus appears that none can enter the kingdom of God save those whose minds have been renewed by the enlightening of the Holy Spirit. On this subject the clearest exposition is given by Paul, who, when expressly handling it, after condemning the whole wisdom of the world as foolishness and vanity, and thereby declaring man's utter destitution, thus concludes, "The natural man receiveth not the things of the Spirit of God: for they are foolishness unto him: neither can he know them, for they are spiritually discerned," (1 Cor. 2: 14.) Whom does he mean by the "natural man"? The man who trusts to the light of nature. Such a man has no understanding in the spiritual mysteries of God. Why so? Is it because through sloth he neglects them? Nay, though he exert himself, it is of no avail; they are "spiritually discerned." And what does this mean? That altogether hidden from human discernment, they are made known only by the revelation of the Spirit; so that they are accounted foolishness wherever the Spirit does not give light. The Apostle had previously declared, that "Eye has not seen, nor ear heard, neither have entered into the heart of man, the things which God has prepared for them that love him;" nay, that the wisdom of the world is a kind of veil by which the mind is prevented from beholding God, (1 Cor. 2: 9.) What would we more? 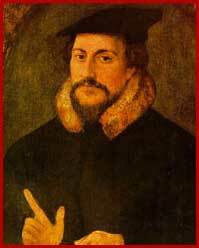 The Apostle declares that God has "made foolish the wisdom of this world," (1 Cor. 1: 20;) and shall we attribute to it an acuteness capable of penetrating to God, and the hidden mysteries of his kingdom? Far from us be such presumption! What the Apostle here denies to man, he, in another place, ascribes to God alone, when he prays, "that the God of our Lord Jesus Christ, the Father of glory, may give unto you the spirit of wisdom and revelation," (Eph. 1: 17.) You now hear that all wisdom and revelation is the gift of God. What follows? "The eyes of your understanding being enlightened." Surely, if they require a new enlightening, they must in themselves be blind. The next words are, "that ye may know what is the hope of his calling," (Eph. 1: 18.) In other words, the minds of men have not capacity enough to know their calling. Let no prating Pelagian here allege that God obviates this rudeness or stupidity, when, by the doctrine of his word, he directs us to a path which we could not have found without a guide. David had the law, comprehending in it all the wisdom that could be desired, and yet not contented with this, he prays, "Open thou mine eyes, that I may behold wondrous things out of thy law," (Ps. 119: 18.) By this expression, he certainly intimates, that it is like sunrise to the earth when the word of God shines forth; but that men do not derive much benefit from it until he himself, who is for this reason called the Father of lights (James 1: 17,) either gives eyes or opens them; because, whatever is not illuminated by his Spirit is wholly darkness. The Apostles had been duly and amply instructed by the best of teachers. Still, as they wanted the Spirit of truth to complete their education in the very doctrine which they had previously heard, they were ordered to wait for him, (John 14: 26.) If we confess that what we ask of God is lacking to us, and He by the very thing promised intimates our want, no man can hesitate to acknowledge that he is able to understand the mysteries of God, only in so far as illuminated by his grace. He who ascribes to himself more understanding than this, is the blinder for not acknowledging his blindness.